Buy the complete Community Life series directly from the publisher and save. Great idea for getting samples of all of these guides. 2 of these 6 guides were developed by Michael C. Mack. What I love about this series is that it is very intentional about discipleship in authentic community. New groups (or even existing groups who need a restart) should start with Launch into Community Life. Each of the other agenda book will help your group(s) grow in vital areas of Christian community disciplines. Each cell agenda book contains 6 lessons (the first book, Launch Into Community Life, has 4 lessons) designed to focus your cell groups (our name for holistic small groups) on the basic values of healthy group life. These agendas will introduce your group members to a whole new way of “doing church” as empowered ministers, and are cost-effective (only one copy per group is needed). Big publishers have flooded the church market with topical studies. 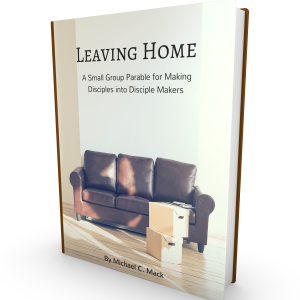 Few (if any) have released curriculum for small groups with the basics of developing a personal and group prayer life (Looking Upward), relationships outside the weekly meeting (Connecting Inward), relational evangelism (Reaching Outward), or moving members into cell group or small group leadership (Moving Forward). The agendas in this new series are actually quite innovative, and move a group into true biblical community.